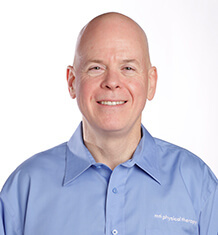 Brian is a co-owner and Vice President of MTI Physical Therapy. He graduated from the University of Puget Sound School of Physical Therapy in 1988. After finishing a 4-year post-graduate residency program and being examined by the Nordic Group of Specialists in Manual Therapy of Norway, he has considerable post-graduate education and experience in the specialty of Orthopaedic Manual Therapy. He practices this specialty to rehabilitate a variety of extremity and spinal injuries and those experiencing chronic pain. His clinical experience has also included headache/migraine management, TMJ dysfunction and fibromyalgia. Brian has treated school aged, college, professional and recreational level athletes in a wide variety of sports. He has worked with members of Cirque du Soleil and currently with the Cabiri, a performance troupe. As a recreational runner and former road racer, Brian enjoys working with runners to rehabilitate their injuries and providing guidance to keep them running or return to running during and after an injury, as well as proper shoe wear/fitting. In addition to his clinical practice, he has been teaching Post-Graduate Residency and Fellowship Programs in Orthopaedic Manual Therapy in the United States and Continuing Education courses throughout Scandinavia, Asia and Europe since 1991. The Annual Conference of the American Academy of Orthopedic Manual Physical Therapists (AAOMPT) 1998. The Annual Conference of the American Academy of Orthopedic Manual Physical Therapists (AAOMPT) 2015. The “Hallvard” from the Ola Grimsby Institute 2005. Given for excellence-in teaching, sharing of knowledge, skills and self-to facilitate and motivate others as both teachers and students. Ola Grimsby Institute Instructor Award 2011. Power B. Manual Therapy Approach to Knee Ligament Rehabilitation. In Ellenbecker T S. Knee Ligament Rehabilitation. Churchill Livingstone, Philadelphia, 2000. Power B. Knee Rehabilitation. In Rivard J, Grimsby O., Science, Theory and Clinical Application in Orthopaedic Manual Physical Therapy, ed. lulu 2008.